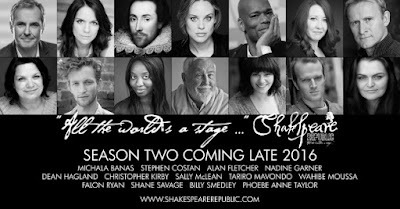 RadioGirlProductions: Get 'on Bard' with Shakespeare Republic -bringing Shakespeare to modern audiences in a brilliant way! Get 'on Bard' with Shakespeare Republic -bringing Shakespeare to modern audiences in a brilliant way! If you have always been keen to explore the work of Shakespeare, but were perhaps put off by heavy dusty books in school, or perhaps teachers who did not make it interesting then this is a fantastic way to take a dip in the Shakespearean swimming pool (come on in, the water is lovely!) ... read on and be inspired to dive in! - Marilyn. Shakespeare Republic was created to introduce Shakespeare to new audiences, performing delicious bite-sized chunks of his works in familiar 21st Century settings. Built on the premise of taking a selection of Shakespeare monologues and making them more accessible to modern audiences by setting each piece in a contemporary situation, their first season in 2015 included Hamlet as Media Advisor to a Government Minister, Juliet as a gay man in a Skype conversation, Phoebe as an entitled Gen Y drunk texting, Macbeth as a politician about to metaphorically knife an opponent, and even a female Hamlet weary from the corporate cut and thrust and a performance of Sonnet 18 as a eulogy. All locations were donated for filming and all cast and crew volunteered their time. It was an experiment to see if their take on Shakespeare could find an audience and achieve what they were hoping to do: show that Shakespeare is just as relevant to us now as he was to audiences 400 years ago. The response to the work on release was astounding. They were 'gobsmacked and thrilled' at the way the work was received. The exciting and talented Season Two cast includes: Dean Haglund (X-Files) Alan Fletcher (Neighbours), Nadine Garner (The Doctor Blake Mysteries), Sally McLean (Utopia), Billy Smedley (Miss Fisher’s Murder Mysteries), and many more! Directed and produced by Shakespeare Republic creator Sally McLean with the assistance of co-Producers, Billy Smedley, Shane Savage and Perri Cummings.Filmed by award-winning Cinematographer, Shaun Herbertson with a highly experienced crew with a total of over 170 professional credits to their names, Season Two is shaping up to be an innovative and exciting ride through the works of William Shakespeare and his contemporaries, featuring an international cast and a lot of love for the Bard. They need to raise AU$4,500 to cover some additional production costs for the main block of filming from September 15-24. They have already put in their own money, to cover items such as costumes, production design elements and most of the catering, and also raised some funds with an earlier crowdfunding campaign in May via the Australian Cultural Fund to cover basic production costs and the expenses of the 23 cast and crew, but there are still a couple of holes in the budget that they need to fill - click here to find out more! After all, every bit helps! Currently 53% funded at the time of posting this so do help them get there! I was terrified by Shakespeare in school, this does look really interesting though!